31,497 backers pledged $1,204,726 to help bring this project to life. 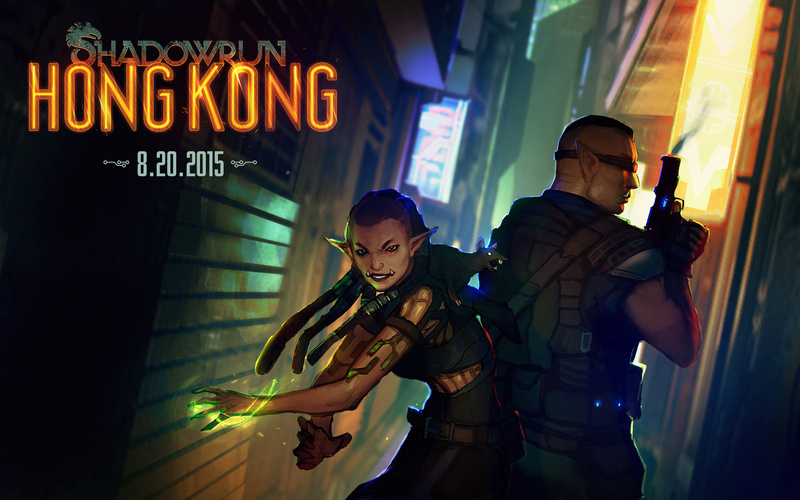 Mitch here, with just enough bandwidth to pull my head out of polishing the game to let you know that Shadowrun: Hong Kong has an official release date! During the Kickstarter, we estimated that we would release the game in August… and that’s why we’re releasing the game in August! August 20th, 2015 at 10am PST, to be specific. On Steam, GoG, & Humble. Here's some nice new wallpaper-sized promotional art! Estimating, scheduling and delivering something as complex as SR:HK is tough and I’m extremely proud of the entire team for their focus, dedication, and hard work. I’d like to say a special thank you to our ace Producer, Chris Klimecky and my co-Director, Mike McCain for their work in getting the game to you on time. 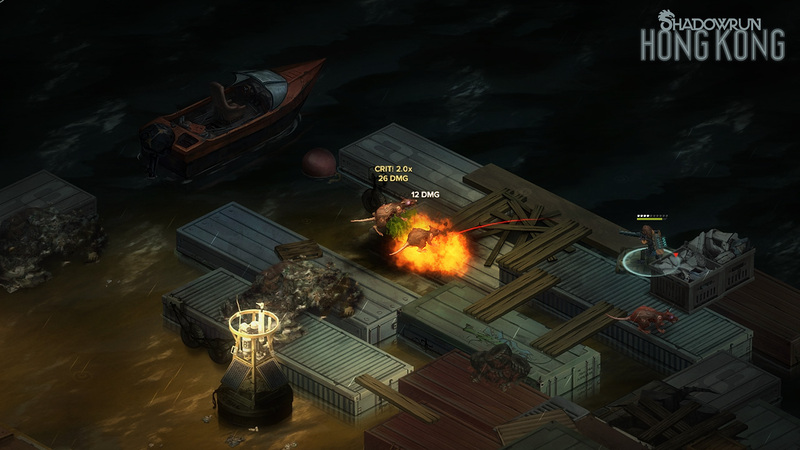 Mike joined me at the helm a ways back so I could dedicate more time to writing, and his work has been first rate - just like it was on Shadowrun: Dragonfall and Shadowrun: Dragonfall - Director’s Cut. The game’s really coming together and it’s amazing to see the team’s hard work and creative collaboration on-screen. Making games is an incredible challenge but making games with these folks is an absolute pleasure. We’ll be sending out another update in the next couple of weeks regarding how to get your keys from BackerKit and an update on all the remaining Kickstarter rewards. In the meantime, here’s a few new screenshots & gifs we grabbed for you. Thanks for staying with us since January and we’ll see you August 20th! The streets of Heoi, your team's base of operations. Gaichu showing off some of his moves. An encounter with some Devil Rats. Is0bel and her trusty grenade launcher. Deep inside the Walled City. Gobbet summons a nearby Shrine Spirit for aid. No Games, No Glory, Guns_n_Droids, and 214 more people like this update. Thanks... that works for me. Did a quick search on the comments, and didn't find anything. Is the schedule going to be similar for the physical rewards? Jerk is a man who keeps beating the dead horse in order to insult or confront other people. Despite jerk`s opinion that he is the most clever guy in the room, this applies only on the situation where jerk stands in the middle of morgue and no doctor is around. We are all one big happy family damn it, and we're all going to start acting like it. This is not me being a jerk, it is me being upset with the same person continuing to ask the same question, but not bothering to read the answers. ...so who is the Jerk? So we're going with continuing to break the "jerk" section of that. Gotcha. 1) Your question was a Known from the start. 2) There are only two pages of replies to this update, and the HBS comment is still on the first page. Oh yes, because I didn't scan several pages down, and this being the first time they actually answered that question after I've been asking for two solid months since they were first actually able to issue keys... I need to learn to look and read. Ever looked at those big bolded blue words just under "Post comment"? Because you seem to need to learn to do the same. Anyways. Good to know, finally. Keys will be made available earlier and we'll be sharing more detail in the coming weeks. ...until you learn to look and read. Are we getting keys before the release? Oh wow, Awesome looking stuff! Been playing Returns and Dragonfall again to get back in the swing of it again, having a blast! Really looking forward to this one as well! This is wonderful news. You guys do really great work and its astounding that you're already delivering this project. One thing, though -- there is a writing an error in the Chinese characters on the "Club 88" sign in the Heoi screenshot. Not sure if it warrants changing the art asset this late in the show; I'm sure everyone will play and enjoy this game no matter what the bloody sign says, but I thought you might want a heads up since the area is a story hub and you'll potentially have a lot of eyes looking at it. Anyway, the sign reads "俱囗部“ -- the corrected word would be "俱樂部"
That boxy looking character in the middle of the incorrect version appears to be the thing that gets subbed into computer generated Chinese text if a character can't be displayed in a particular font. In other words, It is not an error of any translator or language consultant you might have been working with, just a technical flub that can happen if you're copying and pasting a lot of Chinese. Amazingly fast and looks awesome! Thanks for all of your hard work and I can't wait to enjoy it. Congratulations! But that timezone is PDT, not PST! Kickstarter game to be released on time? What sorcery is this? 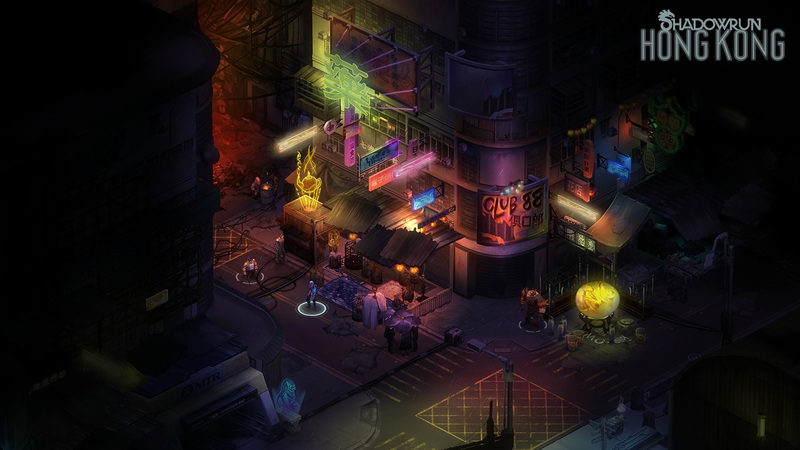 Shadowrun: Hong Kong releasing on the day before my birthday? Team HBS's Precognitive abilities: CONFIRMED! Cool. Just in time for school to be starting up again... Wait a minute! That's not a good thing! Oh well, at least I'll have the OST to listen to while I'm working. Awesome, looking forward to the game! But wait a minute...you guys are ON TIME? But isn't this a crowdfunded project? WHAT IS GOING ON HERE?! Such a good design. 20th of August can't come soon enough. looks very nice. i want it noooooooowwww!!!! The game looks fantastic and I can't wait to play it! Once again, HBS proves just how proficient their team is. I am proud to be a backer for this project. Much, much love to all of you! Thank you and keep it up! Am I just noticing it now or did they really step up their lighting game for Hong Kong. This set of images look amazing. 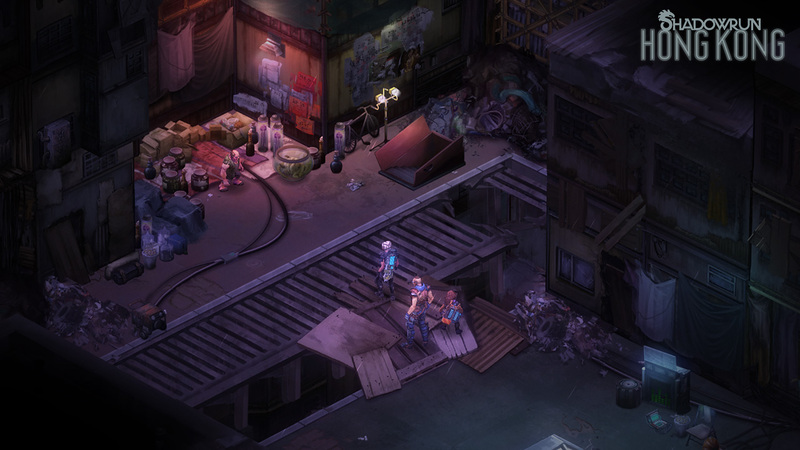 That means I have about a month to finish the Shadowrun: Dragonfall campaign. Christmas is super early this year! Devil Rats make me happy. This is the best Negaunee present i could've asked for. THANKS! If you count being released on Steam Early Access, I've backed a couple of projects that released on time before this. But it is a pretty rare thing. August 20th is so far away. I will encase myself in carbonite until the appointed day. Seriously though, everything looks amazing (especially the improved matrix omggggg). Congrats to HBS for another successful Kickstarter and holy cow I am so excited. Harebrained Schemes, well done! Everything about this Kickstarter project has been a brilliant example of how to KS a game right. @Asa - where is this Matrix picture? I looked on their facebook and on harebrained-schemes.com, but I can't see it! FYI - a picture of the new Matrix was included in the update on Harebrained Schemes website. Not sure why they didn't include it in the kickstarter update.